Searches had been due to resume over the weekend but were postponed due to bad conditions. An Irish Coastguard helicopter searching along the coastline near Blacksod, Co Mayo, earlier this year. SEARCHES FOR THE remaining missing crew members of the Coast Guard Rescue 116 helicopter resumed this morning. A Coast Guard spokesperson said that searches got underway this morning at about 6am. The spokesperson said that conditions were favourable. Searches had been due to take place over the weekend but were postponed due to bad conditions, starting yesterday instead. Rescue 116 went down in March with four crew onboard while preparing to refuel at Blacksod, County Mayo. Captain Dara Fitzpatrick was recovered at sea soon after the helicopter went down, but died later in hospital. The body of pilot Mark Duffy was found in the wreckage of the helicopter some weeks later. The bodies of winch operator Paul Ormsby (53) and winchman Ciarán Smith (38) have yet to be recovered. 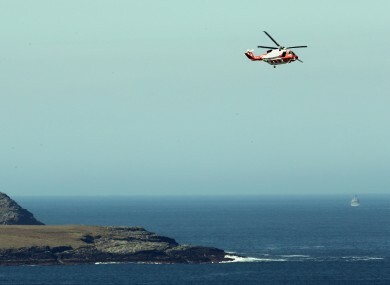 While searches went on for a number of weeks after the crash, it is understood that more favourable sea conditions will mean that a fresh survey of the area around Blackrock island, where the helicopter crashed, will be possible. It is hoped that new evidence may be found during this search, including one of the engines of the helicopter which lies on the seabed. Garda divers will be on hand to conduct dives as they are needed. Last week, RTÉ’s Prime Time programme revealed that a pilot had raised concerns four years ago that Blackrock island off Mayo was not on the onboard warning systems that Coast Guard search and rescue teams use, but no action was taken. Email “Searches resume for missing Rescue 116 crew members”. Feedback on “Searches resume for missing Rescue 116 crew members”.